Dream Vegas is a relatively new online casino that was launched in 2018. But don’t get deterred by this fact. Dream Vegas has everything you could wish for at online casino – from the latest slots to the best of table and live dealer games of course. Interface is pretty stylish and intuitive, you can find here a wide selection of high quality games and simple search options. And you will be certainly excited with awesome promotions offers for both new and loyal players. Players can enjoy a real-time casino conveniently from anywhere with good internet connection with Dream Vegas mobile gaming options. With hundreds of different slots available online you will be able to enjoy gambling on any smartphone or tablet including classic live dealer games. Here on the website you will find all kinds of gambling games for every taste – classics like blackjack, roulette, slots, poker, baccarat, and many more. If you prefer certain developers then you will see that it is easy to find it here thanks to handy search tool. And for those customers who like to play for free first Dream Vegas offers demo mode for most games which is very appreciated. Do you like generous bonuses and competitions? Here’s what you can expect from your Dream Vegas experience. 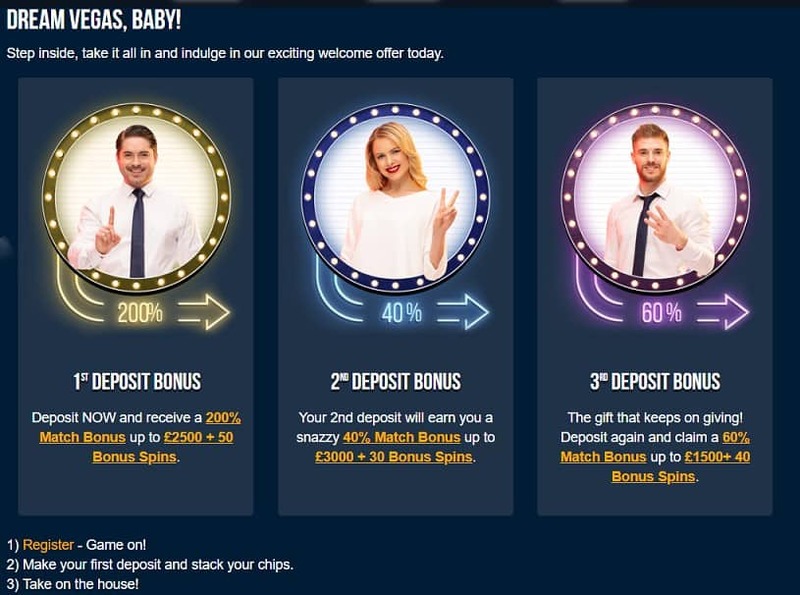 As a new player you can get Welcome pack consisting of a 200% bonus up to $2500 plus 50 free spins. So, with depositing minimum $20 you can enjoy playing for $60 plus 50 free spins. Please pay attention to any promotions terms, because in case of Welcome offer you should know that Skrill/Neteller deposits are not eligible. Also, not all games contribute to wagering requirement. So read carefully. Also, Dream Vegas has VIP lounge. There are few levels you can choose from. Surely, being a VIP customer gives you higher bonuses, cashbacks, faster withdrawals and other benefits. If you are not ready for elite league yet then maybe you will be interested in Loyalty program. 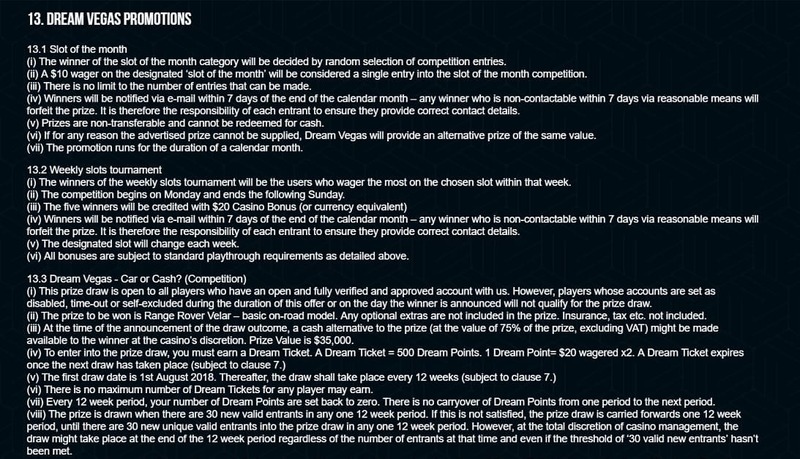 By participating in different tournaments and just playing games you can earn loyalty points that can be exchanged for Dream Tickets and then for great prizes. Check Promotions page at Dream Vegas website to know more. And finally, Dream Vegas offers Slot of the Month and Weekly Slot competitions. So we are sure you are not gonna get bored. Players can choose from different secure payment methods from trusted partners such as Visa, Paysafecard, Neteller, Maestro, Skrill and Mastercard. They can make sure all deposits and withdrawals are completely secure and all information is protected. The Dream Vegas team promises effective support 24/7, all year round and it is always there to provide players with an exceptional customer service. They answer questions and solve problems in a fast and professional way and always make the little extra to help players.